Finding love online isn’t for a select few - it’s now the second most common way to meet someone. And right now is prime time for online dating. Activity on dating sites surges between Thanksgiving and Valentine’s Day, as millions head online looking for someone to help them get through all of that turkey, mulled wine and holiday party small talk. 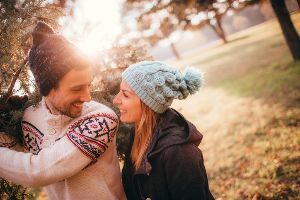 So take advantage of this swell of singles with our 4 must-follow tips for finding the right kind of connection online. A big part of meeting someone is simply being in the right place right time. And much like wintery snowflakes or the array of ugly sweaters at your company’s Christmas party, no two online dating experiences are alike. So instead of heading to a dating site where your friend had luck and then bemoaning the fact that you can’t replicate her magic, think about what you want in a dating site, what hasn’t worked in the past, and how to best set yourself up to find your person. If you’re looking for a popular site but don’t want to get lost in the crowd, try Zoosk . The site’s Behavioral Matching tool gets to know your habits - likes and dislikes - and offers matches accordingly. It’s designed to gauge your own personality, and what you’re looking for, and then match you with someone you’d mesh well with. The site also gives you the option to browse on your own, but the added bonus of personalized matches creates a less overwhelming experience. Yes, swiping through photos of eligible singles is somewhat addicting. But the point of online dating is to make real connections. So when you match with someone, don’t wait for the other person to send the first message. Initiate something yourself, or it may never lead anywhere. This is especially true during peak season when so many likes and messages are being exchanged - making it easy to get lost in the shuffle. Plus, messages sent within the first 24 hours are twice as likely to receive a response. The most reliable way to be ignored on a dating site is to send a message that simply says “Hey.” Even when thousands of people aren’t signing up in droves to dating sites, a simple “hey” isn’t likely to elicit a response or make anyone take notice. This seems obvious, but I can’t even count the number of men who have messaged me on dating sites with nothing more than this. Even if Ryan Gosling himself sent over a “hey,” I wouldn’t respond - it’s lazy and shallow, and the recipient of the message is (rightfully) assuming you’re sending this same message to the dozens of other singles you matched with. Instead, take a look at the dater’s profile and pick something out that you can use to start a conversation. This is what makes dating sites with actual profiles so great. Sites like Match have detailed profiles, so you’ll have a lot to work with. Combine that with Match’s personality pairing for better matches, and now we’ve got something to work with. Take the holiday energy you’re feeling from all of the twinkling Christmas lights and endless loops of “Baby it’s cold outside” playing from your office radio and apply it to your dating game. For ladies, this usually means making a bold move - initiating the conversation, sending the first like, or simply giving a chance to the match you might’ve passed on. For men, take the first date up a notch with something like Hot Toddys at the ice skating rink. It’s the perfect time to get out of your comfort zone and try new things. Ready to try some of our tips out? Head over to Zoosk today. Their smart matching may just be the key to making online dating work for you.